soda fountains have evolved from dumb machines into instrumented devices with touch-screen user interfaces. This digital transformation is changing the way applications are developed, tested, moved through environments and released into production—and it’s putting new demands on IT teams with which they’re struggling to keep up. 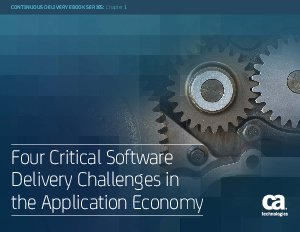 At a high level, this is because the application delivery systems and processes at many enterprises were put in place when IT only had to push out an annual or semi-annual release. But as market pressures and executive mandates have forced teams to deliver innovations faster and more frequently, a new set of development, testing, automation and customer challenges have appeared—acting as obstacles that stand between you and your digital transformation goals.